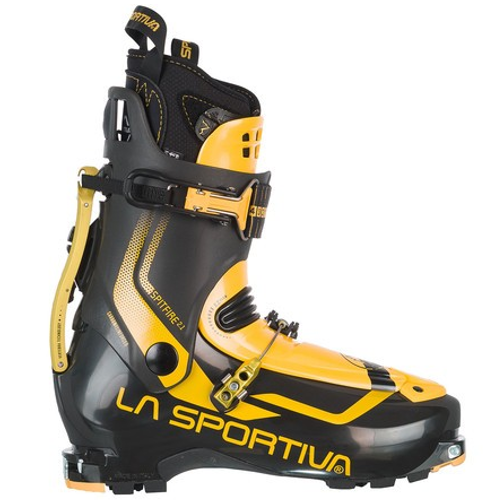 La Sportiva's performance lightweight 2 buckle touring boots are superb on the ascent, super light weight 2.32 KG (per pair) and with a stunning 68 dgrs range of motion in walk mode, the Spitfire 2.1 make a great ski touring boots for the longest days and weeks. Click them in to ski mode by simply clipping the top buckle up and these lightweight tourers don't disappoint, giving a surprising amount of ski support in the forward flex and good lateral power transmission. Compatible with Pin Tech bindings only (including the Trab TR2). With a good medium to low volume fit and a thermo fit liner the Spitfire are an excellent boot for fast and light ski touring.